The Coleman 9940-A55 Roadtrip Party Grill is equipped with features that would answer the needs of every user when going out for a camping, road trip, or any outdoor activities. It has an 8000 BTU burner control system which enables you to grill or cook your food fast and done. It also has a PerfectFlow propane pressure control system which maintains its heat. Along is PerfectFlow regulator that allows a steady fuel stream regardless of the weather, altitude, and amount of fuel. With its InstaStart ignition technology, you can start-up with this grill without the use of any matches. It is also very easy to clean since its parts are prepared to be dishwasher-safe. This grill is perfectly handy for easy transport and storage. This Coleman 9940-A55 Roadtrip Party Grill performs well and greatly serves its purpose. It heats up faster than any other portable grill. With that, it allows food to be cooked evenly and quickly. For about two years of use, this grill still works perfectly and it was found to be very durable. 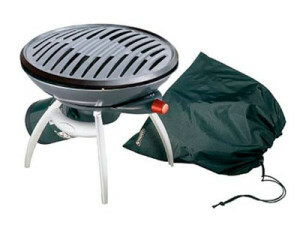 Its design fits well for outdoor activities like road trips, picnics, and camping. It is very light in weight, compact and it comes with a carrying case for easy handling and storage. Aside from that, the grill is so easy to clean and maintain after use. There were some problems noticed upon using the Coleman 9940-A55 Roadtrip Party Grill. It does not perform well especially that there is no lid that goes with the package, cooking will take some time before you can eat your food. The design does not promote safety since there is no protective piece that separates the flame and the dribbling grease. There were some issues also with the instability of the top grill since its supports does not balance well. The materials used in some of its parts were kind of inappropriate just like the cover. It is made up of plastic thus it is not good to use for covering cooked food. The built-in igniter in most cases does not work and the control knob is very weak.